Glisse Pro pointe shoe features a medium vamp, hand-flattened crown and a wide platform. It includes a feathered toe box, round shape throat, low sides and heel. The shoe has a soft cotton lining, satin binding with elastic drawstring and a short leather outer sole. The shoe fits best on medium to wide forefoot with toes of even length. 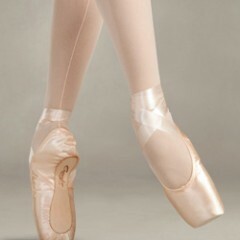 The Glisse pointe shoe has a #3 leather board shank and 3/4 skived to zero.